Dorje Denma Ling offers indoor accommodations in Gyatso Lodge, and in our beautiful, fully insulated Drala Cabins. 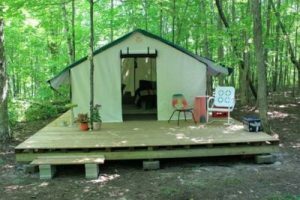 In addition, a variety of outdoor accommodations (listed below) are available from June until mid-September. Gyatso Lodge has double and triple rooms with two shared hallway bathrooms on each floor. Lodge accommodations are available for $55 per night per person. 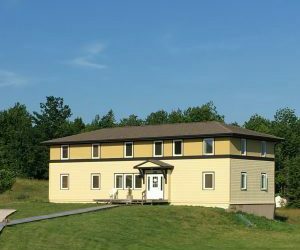 Dorje Denma Ling’s summer housing grounds are spacious, with gorgeous views, and in short walking distance to our two shower houses and to the main program complex. Since there are a limited number of indoor beds available, please apply at least 30 days in advance if you need one for health reasons. For those staying in the lodge or in a Drala cabin, bedding is provided. Please bring a sleeping bag for outdoor accommodations including huts, wood cabins and tents. For huts, tents and wood cabin accommodations bring a battery-operated lantern. No gas, candle or propane lighting of any kind is permitted. A shower house is located near the Drala cabins, between Buddha and Vajra fields. A second shower house is located near Tiger field at the main building. 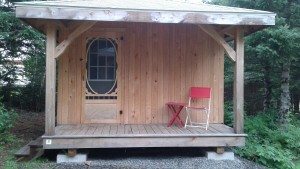 $75 a night for one person and $130 for two. Double room – private ensuite bath, house overlooks river. 3 Rooms. Two rooms – Double bed One room – Queen Bed, Shared bathroom. Shared Bathroom; 3 cats in house. Tranquil country setting on a small hobby farm. One bedroom, shared bath, $30/night. Queen size bed.